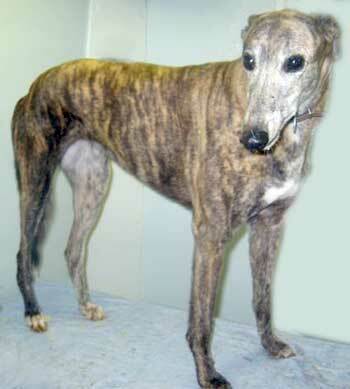 Odessa, aka Internet Power, is a stunning 9-year-old brindle female, born February 23, 1996. She and Omega are littermates sharing the same sire, Say It Best, and dam, Ocean Floor. Greyhound-Data.org does not show any racing history for Odessa, so her racing history is a mystery at this point. Odessa whelped one litter, according to Greyhound-Data.org, in April 2000, producing 3 greyhound pups with Evening Memory. She did spend the last year as a blood donor, and as with most greyhounds, has given more than her fair share. It is about time Odessa finds her forever home with a couch to lounge on. Dr. Jeff Ellis referred Odessa to Dr. Noele LaCroix at the Animal Ophthalmology Clinic because he suspected bilateral pannus. Dr. LaCroix confirmed his tentative diagnosis. Dr. LaCroix says the best way to describe her vision is that she has really, really dark sunglasses on. She has been put on medication to stop the progression of the pannus. Omega's eye condition is manageable and with continuous daily medication, is not expected to progress.